Year 11 pupils are celebrating excellent GCSE results today, with over 97% of the new style exams being awarded a “standard pass” or better at the new grade 4 and above. 75% of the cohort achieved a “strong pass” at grade 5 and above in English Language and Mathematics. More pleasingly, at a time of much curriculum reform designed to make examinations more challenging, 50% of the grades achieved in Mathematics alone were grade 7 or above. Hydesville Tower School pupils have outperformed a number of national average results: 100% of Hydesville pupils achieved a grade 4 or above in English Language, with the national average being 64.9%. In Mathematics 91.7% of Hydesville pupils achieved grade 4 or above, significantly exceeding the national average of 68.9%. Sameer Ali particularly excelled, gaining six grade As, two grade 8s and a grade 7. 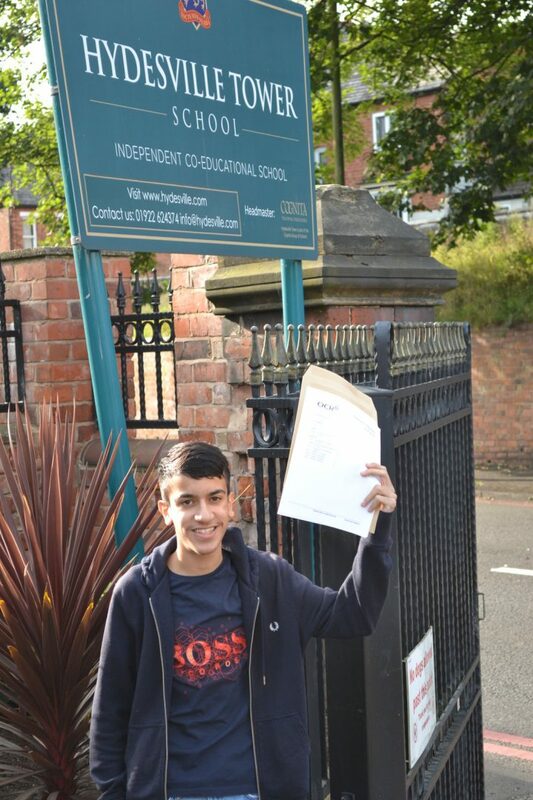 Itai Allen also obtained nine GCSEs in total for which he achieved A*-B grades. The 2017 GCSE results build on the excellent results seen in previous years and reflect the school’s annual focus on improving the proportion of top grades. This year, 37% of grades were at A*-A (with the national average being 22.1%), 72% of grades were A*-B and overall 99% of grades were at A*-C. Hydesville Tower School is a non-selective school, so these results reflect tremendous achievement and progress being made over the course of the last five years. It is another great year of examination results for the school where pupils are taught by subject specialists in classes of around a dozen or fewer children. Overall, 13 departments achieved a pass rate of 100% A*-C and a significant proportion of pupils surpassed their baseline Year 7 forecast by a huge margin across the board, exemplifying the school’s ability to add value to pupil progress. The value-added performance measure serves to highlight the significant difference Hydesville Senior School makes to each child’s progress and attainment compared to the national average for a child of their ability. This year’s overall results once again also exceeded the baseline predictions made in Year 7 which indicated that 72% of pupils were likely to achieve 5 or more GCSE at grades A*-C .
Visit the School’s Open Morning between 10:00 am and 12:00 midday on Saturday, 23rd September 2017 to discover what Hydesville Tower School can offer your child. Call 01922 624374 or see www.hydesville.com for details and to register your attendance.